John Walsh founded America's Most Wanted after police failed to nab the person who killed his son, Adam. But on Dec. 16, police revealed the killer's identity and officially closed the case. TIME looks at more than a century's worth of other mysterious cases. 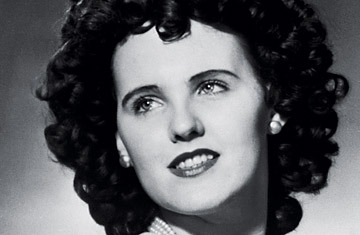 Hollywood's most famous murder case unfolded on January 15, 1947 when the raven-haired, 22-year-old actress Elizabeth Short was found dead on Norton Avenue between 39th and Coliseum streets in Los Angeles. Her body had been cut in half and appeared to have been drained of blood with precision. The murderer had also cut 3-inch gashes into each corner of her mouth, creating a spooky clown-esque smile. Short's murder quickly became a sensation, not only because of its location in the show biz capital, but also because the police worked in tandem with the press to disseminate clues in hopes of locating a suspect. Several people confessed, only to be later released for lack of evidence. Much speculation surrounded the details of Short's life. Grieving after the death of a man she fell in love with, she reportedly befriended many men while frequenting jazz clubs, making it nearly impossible to pin down who she could have been with before she died. Her unsolved murder has spawned several movies, television specials, and books. One such account was written by Steve Hodel who implicated his own father, a Los Angeles doctor, as the Black Dahlia murderer. No charges were ever filed.